Withdrawing into our own magical world of words, is most certainly a writer’s dream. Whether we imagine it to be a beach house, a woodland cabin or a study with a lock on the door – having our own solitary space has magical ramifications. We imagine our greatest work revealing itself as we sit in solitude, allowing our muse full reign on our time. I was fortunate to attend a retreat in February 2012 at Strawberry Creek. With several other members of my writing group in attendance, we managed to revise, edit and write new and existing manuscripts. With the choice of writing alone or in a group, everyone found their comfort zone. Gathering together for meals, which are made for us and evening conversation in front of a roaring fire, it was a perfect sequester from our every day lives. The plan is to enjoy this retreat again in the spring of 2014. I am so looking forward to it. A long weekend of words and like minded people, what more could you possibly ask for? Was it all you wish it to be? If you could have your own ‘retreat’ where would it be? 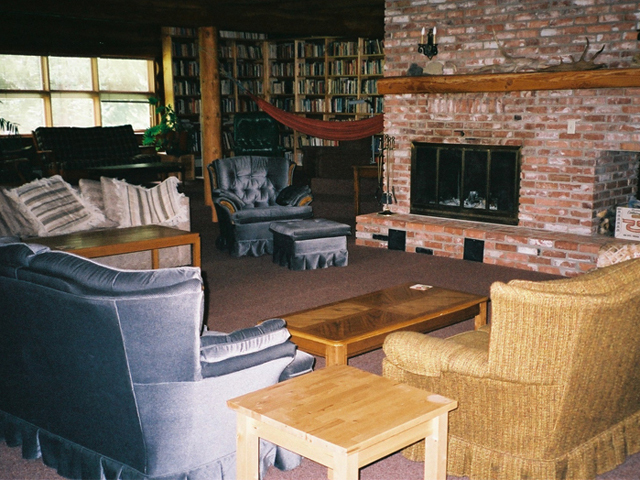 Part of the lounge/library at Strawberry Creek.